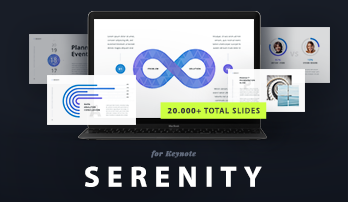 Business Plan – Multipurpose Keynote Template - Download Now! 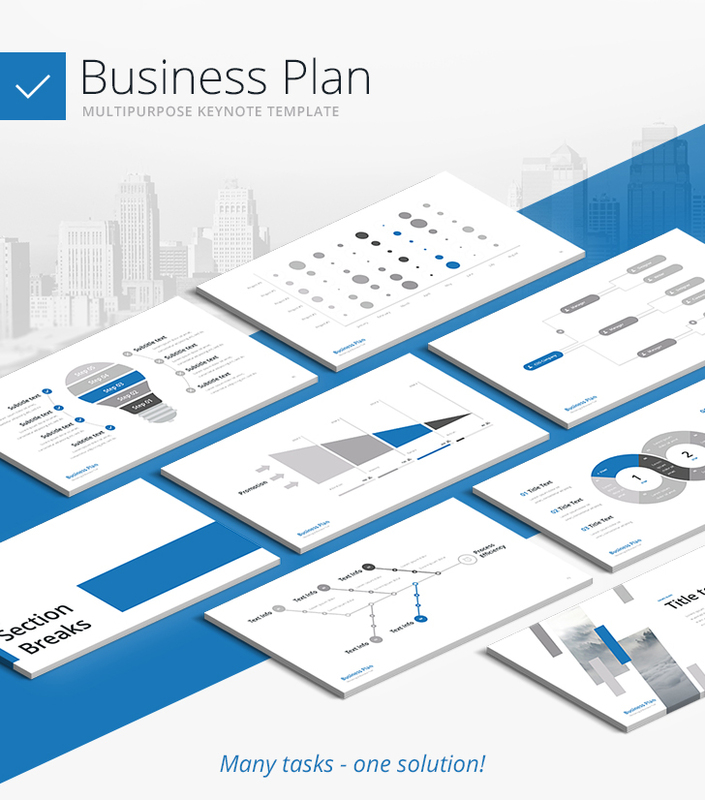 What is the Business Plan – Multipurpose Keynote Template for? 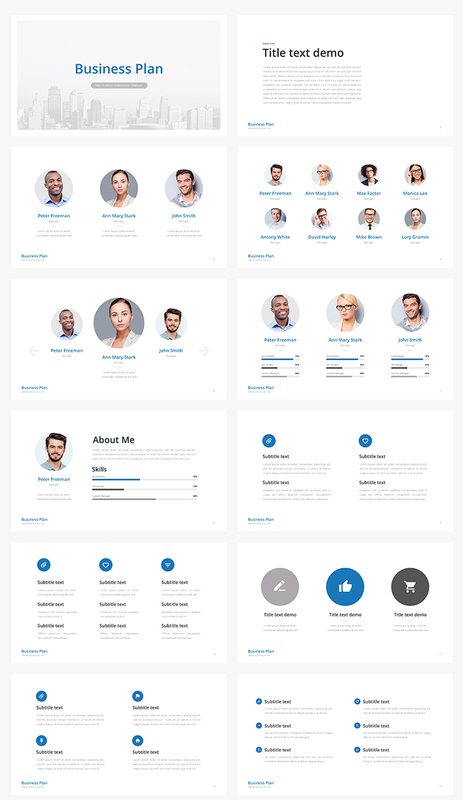 A new multipurpose template is designed to help office employees and businessmen to make their work easier and simpler, save time, facilitate working process and turn it from boring to interesting. 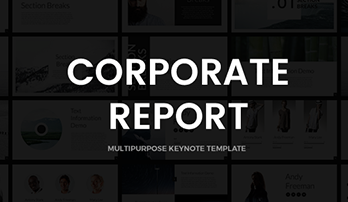 If you are the one who constantly creates projects, speaks to the audience, and presents a business plan, reports, startups, projects and others, this template is definitely for you. The main peculiarities of the slide will be discussed further, but we can affirm with confidence that this template will help you while preparations for conferences or meetings, attract listeners’ attention while project presentation, and impress company’s executives and your colleges. Due to a modern professional design in a combination with a highly-informative content of the template, it is a unique useful tool for every self-respected employee. 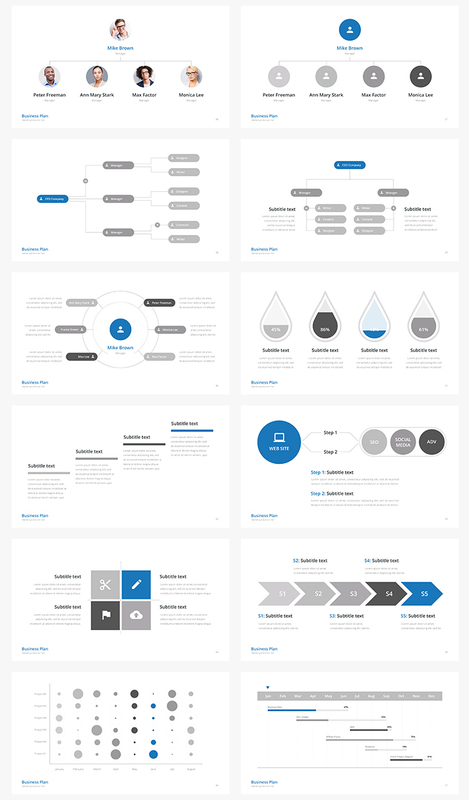 The composition of the Business Plan – Multipurpose Keynote Template. The template is composed of 100 unique slides. It is available in 5 color themes and the total number of all slides accounts 500. Structurally, the template is cut into sections or slides groups according to their functionality. A large number of provided slides give you the opportunity to choose the ones you need and make a perfect unique business plan or other project. Therefore, the following groups of slides can be found in the template: organizational slides, lots of infographics and charts (Gantt chart, for instance), timelines and various diagrams, pricing tables, SWOT analysis slides, maps, mockups, section breaks slides, so on. With such a great choice, you will be able to express information of absolutely any kind and create an informative project that everyone will appreciate. 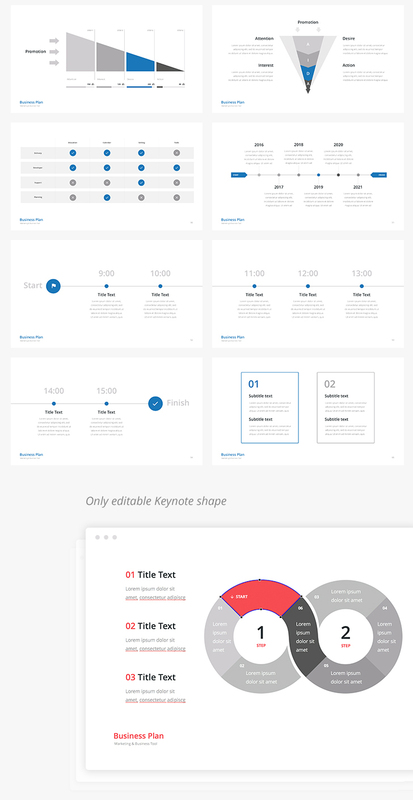 On this page, you can find the preview video of the template. It includes the demo of the slides with animation. What are the advantages of the template? A number of advantages inherent in this template make it competitive. Due to the following characteristics, the template gets deserved attention and is quite popular in various fields. High quality. Starting from the beginning, our templates have been of excellent quality. This template is no exception. It is most likely that you will present the project based on our template on the displays with high resolution (such as projector and others). The handouts of the presentations are also widely used at meeting and conferences. In these cases, the quality won’t change. There won’t be blurred lines or visible pixels. A multipurpose template. This set of slides gathered together allows you to combine them as you wish and therefore create different presentations and business plans. The template is widely used in marketing and business, economy. It helps you to present data in a clear way and reflect the key points of the issue. Built-in tools. 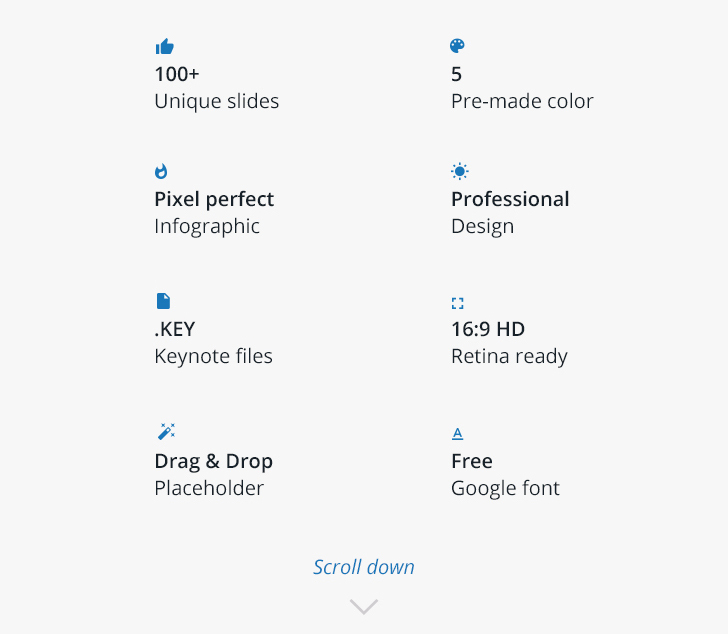 To our template, we apply built-in tools that make work more convenient and productive. 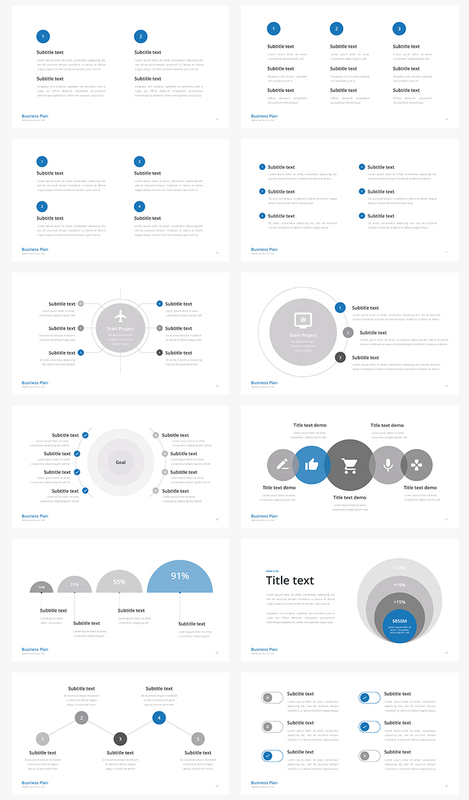 Due to these tools, you can freely edit size and colors of infographics, diagrams, etc. It is possible to edit the charts with Excel or iWork table. A ready-made easy-to-use template. 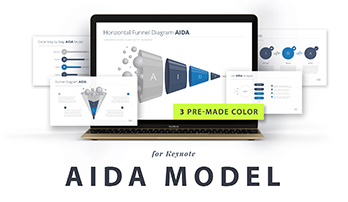 Ready-made slides allow you to work quickly and create presentations in a few minutes. Even the beginner will be able to learn the principle of work with it. This way, the template can help you at work, save time and facilitate the process of work. Support 24/7. Support 24/7 is available for our clients. Our support team will be glad to answer your questions. Feel free to contact them.